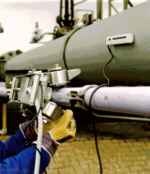 Increasingly, pipeline and plant operators apply non-destructive testing (NDT) as an economic tool to establish the condition and integrity of their equipment and components. Results are used for predictive maintenance and life-time extension programmes. This approach, unless risk based inspection (RBI) is used, requires more surface coverage of the inspected locations than can be achieved by common spot-check inspection techniques . Full-surface coverage with NDT inspection is often prohibited due to unsuitable methods which are slow and hence too expensive. This created the demand for the so called screening tools with which suspect areas can be detected very rapidly. In recent years several of these methods have entered the market. In this paper two methods will be discussed that can be applied on carbon steel components. The first method is based on magnetic flux leakage (MFL) and is suitable for inspection of non-insulated components. The second method is a Pulsed Eddy Current technique called INCOTEST which can be applied on insulated components. MFL tools are suited for inspection of exposed bare, painted or thinly coated carbon steel components. Nowadays MFL is a well-known matured technique, extensively used for example in intelligent pigs. 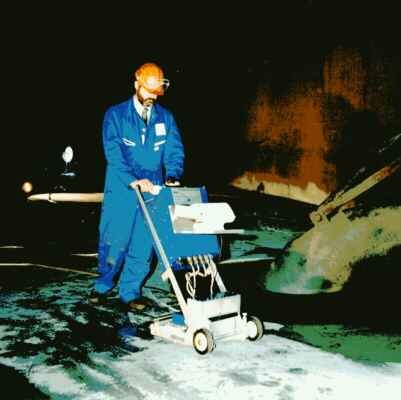 RTD launched this technique in the 1980's to inspect the floors of storage tanks. The family of scanners now includes the Floorscanner and Mini Floorscanner for inspection of storage tanks, the Pipescan for inspection of piping and the Wallscan for inspection of vessels.The principle of MFL is shown in Figure 1. A strong magnet is used to establish a magnetic flux in the material to be inspected. When there is no defect the uniform flux remains in the metal as illustrated in Fig. 1. In contrast, Fig. 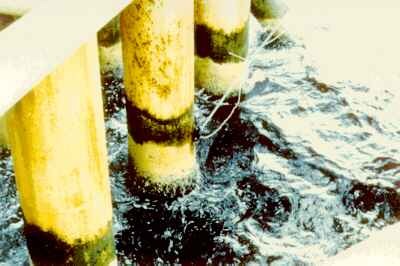 1. also illustrates the flux leakage that occurs when there is a defect due to corrosion or erosion. Near the defect the flux "leaks" out of the metal. Sensors which can detect this flux leakage are placed between the poles of the magnet and generate an electric signal proportional to the magnetic leakage flux. Defects causing a leakage flux exceeding a predetermined threshold are detected. The amount of leakage flux is dependent on depth, orientation, type and position (topside/bottom-side) of the defect. Defects exhibiting various combinations of volume loss and depth can produce the same flux leakage level. Therefore truly quantitative depth information can not be obtained by this method. It is a qualitative not a quantitative inspection tool. For accurate sizing of the defects ultrasonics can be applied after detection. Typically storage tanks suffer from corrosion at the underside of the floor bottom. Often this type of corrosion will be localised (pitting), sometimes larger areas may be corroded, for instance at places close to the tank shell. Having access only to the top surface of the floor this corrosion can not be found by visual inspection. 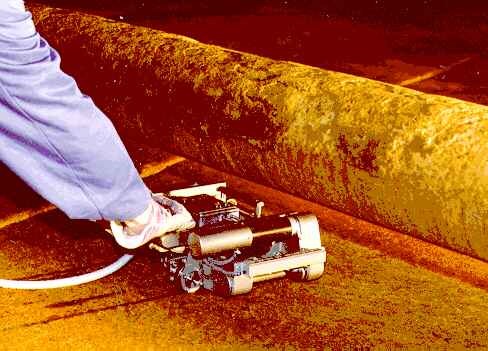 Therefore an inspection method is needed that can detect underside corrosion from the topside and can give a full coverage of the floor as corrosion may occur every where. For this application the Floorscanner and Mini Floorscanner (see Fig. 2a and Fig. 2b) have been developed. The Floorscanner is used for inspection of most of the inner plates. This scanner is self propelled. With its scanning speed of 40 cm/s and scan width of 25 cm it can inspect 250...500 m2 per day. At hard-to-access areas (below heating coils, at annular plates close to the tank shell) the self propelled Mini Floorscanner may be used. This is a very compact Floorscanner with a height of only 13 cm. Both scanners together may cover up to 97% percent of the tankfloor. The remaining areas, near welds and corners, may be inspected by ultrasonics. Typically with common MFL wall thicknesses up to 15 mm can be inspected. For thicker walls the magnet system would be unpractically heavy. A recent development however has led to a new type of Floorscanner that overcomes this limit. This device, called SLOFEC (Saturation LOw Frequency Eddy Current), can inspect walls up to 30 mm. Like MFL it uses a strong magnet to establish the magnetic field. However it uses an eddy current sensor for detection of defects. In Fig. 3. a comparison of sensitivity of MFL and SLOFEC is shown as a function of wall thickness. 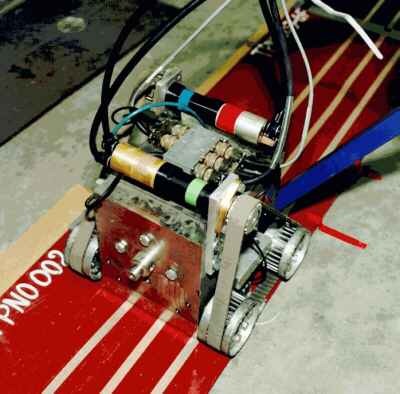 Figure 4. shows the prototype of the SLOFEC equipment already applied commercially to inspect tank floors. At present a more compact version is under construction with reduced weight. Fig 3: Sensitivity comparison MFL and SLOFEC technique Fig 4: Prototype SLOFEC scanner for thick wall tank floors, tank shells, ship hulls, buried bullet tanks etc. After inspection, each severe MFL indication will be quantified by means of an ultrasonic wall thickness measurement. All obtained data, including position information, will be stored. 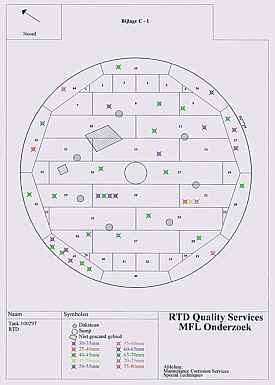 By means of newly developed reporting software called "FLOOR MANAGER" the results of the tank inspection may be presented as shown in Fig. 5. Piping and vessels suffering from internal corrosion or erosion can be inspected from the outside with the Pipescan or Wallscan. 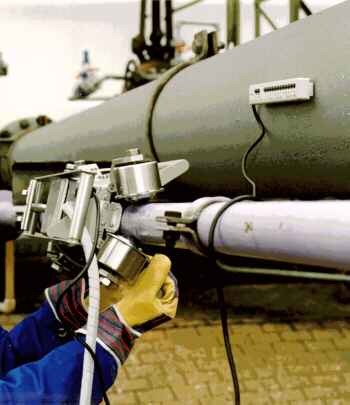 The Pipescan can be used on small diameter piping (diameter >= 2").The Wallscan can be used at larger diameter piping or vessels (diameter >=6") and is also frequently used for inspection of tank walls. Both Pipescan and Wallscan can be used for wall thicknesses up to 15 mm. They can be adjusted for a particular diameter and can be used both on the exterior and or the interior of a vessel or tank. Figure 6. shows the Pipescan on 3" piping. With the straight sensor array on roller balls up to 100 metres per day can be inspected. This type of Pipescan requires a zigzag scan, hence the roller balls. This type of Pipescan can well detect grooving type of erosion/corrosion. For large quantities of pipe of same diameter a horse shoe shaped sensor array, partly encircling the pipe, can be applied for fixed diameter piping as shown in Fig. 7. With this scanner a much higher inspection rate can be achieved. The horse shoe Pipescan only requires axial movement along the pipe. Recently a 3" scanner fully encircling the pipe has been introduced which allows to inspect up to 1,000 metres per day. This tool also indicates gradual wall loss, unique for MFL tools, and is used in the Middle East to inspect bare flow lines on supports. For inspection of thermally insulated carbon steel components the RTD INCOTEST (INsulated COmponent TEST) has been developed. INCOTEST uses the electromagnetic method called Pulsed Eddy Current. It measures the wall thickness without the need of having contact with the steel component itself. The phenomenon of Pulsed Eddy Current works as follows. A special coil is placed on top of the thermal insulation. This coil consists of a transmitter coil and a receiver coil. The current through the transmitter coil is pulsed. First the transmitter coil is activated, current is flowing, and a magnetic field is established in the steel wall. Then the current is switched off and the magnetic field vanishes. As a result eddy currents are induced in the top side of the steel wall. These eddy currents then diffuse into depth and decay with a certain rate. Once they arrive at the back wall the eddy currents decay more rapidly. With the receiver coil this time of arrival at the back wall is sensed. At places with wall loss the arrival time will be earlier than at places with no wall loss. From this time of arrival INCOTEST calculates the average wall thickness. A change in wall thickness indicates the presence of corrosion or erosion. INCOTEST is a static method. A measurement takes approximately 2..5 seconds during which the coil does not move. Per day up to 1,000 measurements can be taken. Typical fields of application are detection of corrosion under insulation and erosion but it can also be applied for measuring wall thickness through coating or scaling. The main field of application for INCOTEST is detection of corrosion in insulated components. A considerable proportion of processing and power plant pipework is thermally insulated (hot/cold). Not only does this insulation hamper visual and ultrasonic inspection, but water ingress and condensation can cause severe external Corrosion Under Insulation (CUI). Removing and reinstalling insulation is labour-intensive and sometimes quite expensive (asbestos insulation). In this case INCOTEST can be applied. It can measure wall thickness through the insulation up to 100 mm thickness (including chicken wire and aluminium or steel sheeting). The measurement area (footprint) depends on insulation thickness (= sensor lift-off) and type of sheeting, see Fig. 8. Typically at 50 mm of insulation a corroded area having a diameter of 80 mm can be detected. Table 1. summarises the performance of INCOTEST. INCOTEST can detect internal or external corrosion/erosion but not differentiate. The method is therefore also suitable for detection of internal erosion like FAC (Flow Accelerated Corrosion), a phenomenon observed in power plants . The method has already been applied on insulated piping, vessels, elbows, tank walls and tank roofs. INCOTEST equipment is shown in Fig. 9. Although INCOTEST was originally developed for large standoff applications it can also be used for (semi-)contact measurements. The method is suitable for measuring through non-conductive and non-magnetic coatings and thick layers of deposit. A typical example is shown in Fig. 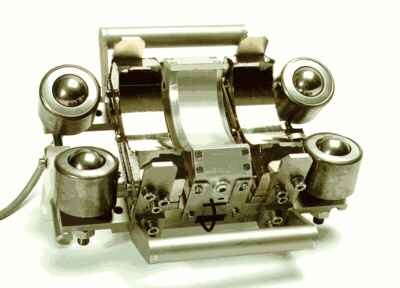 10., which shows the coil being used to measure wall thickness of a riser pipe through marine growth. Experiments showed that with this method the wall thickness of a riser pipe can be measured through 20 mm Neoprene coating or through a 6 mm Monel cladding. For semi-contact applications the measurement area can be very small. For lift-off smaller than 5 mm wall loss having a diameter of 20 mm can be detected. This can also be attractive to measure e.g. encrusted boilertubes.